I attended Author 101 University last weekend in Los Angeles, California. It was a nice event and I had a lot of fun. My publishers at Morgan James Publishing were there, and it was nice to see them and watch them speak at the event. Rick Frishman puts on and hosts the conference two times a year. He is one of my publishers at Morgan James, and he is also the founder of Media Connect. A few presenters that I really liked were John Assaraf, Wendy Lipton-Dibner, and Barbara De Angelis. They had some interesting things to say about life and writing. I also got to see my nieces, Megan and Fayth. Both of them live in California, and they came to the hotel to visit. I stayed at The Westin Los Angeles Airport, which was where the event took place. I enjoyed it. Fayth goes to school in Santa Barbara, and she had a two-hour drive to the hotel. It was nice of her to pick me up from the airport on Friday, and drop me off on Monday morning. I really appreciated that and the time I got to spend with he r and Megan. The event ended at 2pm on Sunday, and then my nieces and I went to Hollywood in the evening. I wanted to do some sight-seeing, since I’d traveled all the way to California from Michigan. I had never been to Hollywood so we went to Hard Rock Café on Hollywood Boulevard for dinner. 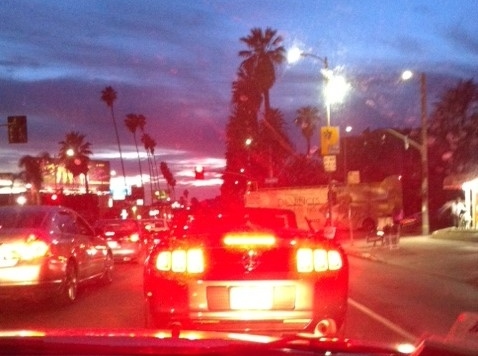 Then we took a nice drive through West Hollywood at night. I was able to see Sunset Boulevard and Beverly Hills. It was really pretty with the palm trees and lights. Of course the weather was just perfect there all weekend!